CLARKE, Clarence Levy Clarence passed away peacefully in his sleep on October 16, 2018 in his 94th year. 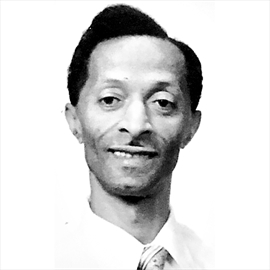 He is fondly remembered for zealously sharing the Bible's message with all and for his friendly and helpful ways when he worked from the Gaukel St. Post Office as a postman and as a counter clerk at the Waterloo Post Office and other postal stations. Clarence was born on December 16, 1924, in the British West Indies (Jamaica). In 1948 he emigrated to England on the ship Empire Windrush. In 1965 he and his family immigrated to Canada. Clarence is survived by his loving wife Winnie and their family members, Yvonne (David), Sislyn, Robin (Patricia), Courtney (Hélène), Yvette, David (Leona), Corbin (Melissa), Lydia, Ashleigh, Owen, Ella, Kai, sisters-in-law and many nieces and nephews. He is predeceased by his parents, four siblings and his youngest daughter Simonette (2017). A memorial for Clarence will be held at the Kingdom Hall of Jehovah's Witnesses, 355 Gage Ave Kitchener, ON on Saturday, December 1, 2018 at 1:30 p.m.